For too long, marketers of sustainable goods and services have targeted "deep green" consumers to promote their products – and they have little to show for their efforts. 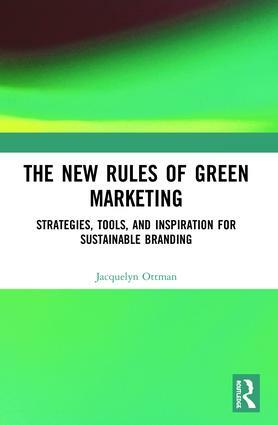 In this innovative book, Jacquelyn Ottman shows how the green market has moved beyond such niche marketing, and how marketers will find greater success promoting the inherent superior value of their offerings. Greener products are now available within every industry and are a part of our everyday lives. But they didn't get to be so ubiquitous just because they are better for the planet. Whether they were promoted as such or not, sales of green products have grown so fast because of the added value they provide: health, superior performance, good taste, cost-effectiveness, or simply convenience. This central emphasis on primary benefits – the new rules – is critical to winning over the mainstream consumer and to driving overall organizational growth. The New Rules of Green Marketing helps readers understand why value-based sustainability marketing has become a critical organizational capacity, and how readers can adopt this approach in their own organizations. Illustrated by examples from both international mainstream and the more niche "deep green" leaders who are showing everyone else the way, the book provides practical strategies, tools and inspiration for building every aspect of a credible value-based green marketing strategy, including:How to use a proactive approach to sustainability to spur innovationHow to frame environment-related benefits with relevance to mainstream brandsHow to communicate with credibility and impact – and avoid "greenwashing"How to team up with stakeholders to maximize outreach to consumersHow to use a life cycle orientation to ensure the integrity of one's offeringsHow to best take advantage of recent technological advances in social mediaDrawing on the latest data from leading researchers and reflecting on learnings from Ottman's corporate clients and other pioneers including GE, Nike, HSBC, Method, Starbucks, Timberland, HP, NatureWorks, Philips, Procter & Gamble, Stonyfield Farm and Wal-Mart, this book shows how market leaders are edging out the competition using effective value-first marketing strategies. This book captures the best of the author's previous groundbreaking books on green marketing and takes the content into the 21st century. Whereas earlier works focused on readers who were less familiar with green initiatives, this work squarely focuses on a new generation of marketers who likely themselves grew up with an appreciation of sustainability and who want and need to know how to connect effectively with mainstream consumers.